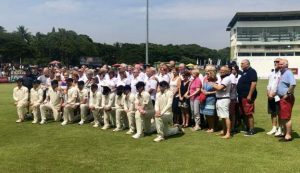 In November 2018, our experienced Tour Manager Derek Myers, guided a group of cricket enthusiasts around Sri Lanka, following the England team in their three match test series. They were privileged to see England claim a 3-0 whitewash, winning the games by 211, 57 and 42 runs respectively. There was a mix-up with accommodation before the tour started, with someone at the Sri Lanka Cricket Board forgetting to book hotel rooms for the players and staff. But Derek was already there and managed to ensure that those travelling with Sport Links Travel weren’t moved into accommodation miles from the ground. 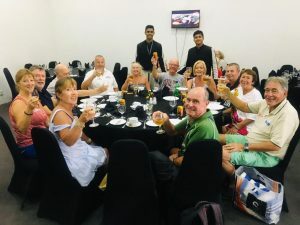 As well as the cricket, guests were treated to delicious meals, excursions and trips to the beach, during their month long stay on this most beautiful of island countries. 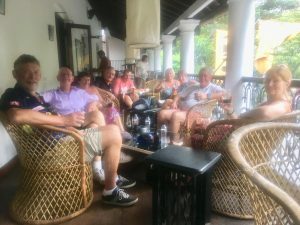 Here are some of the photo’s taken during the time in Sri Lanka, to tempt you into joining one of our future tours following the England Cricket Team. Our group and others having their photograph taken with the England team on the pitch in Kandy, Sri Lanka. Sport Links Travel guests having lunch in the hospitality suite at the stadium in Kandy, Sri Lanka. Enjoying a drink on the terrace of a restaurant in downtown Kandy, Sri Lanka. 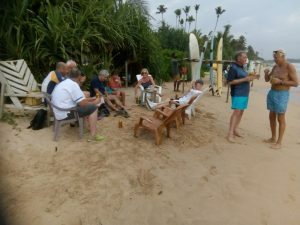 Relaxing with impromptu drinks on the beach in Weligama, Sri Lanka. 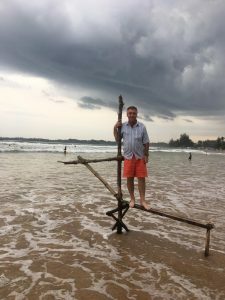 Derek Myers, standing on a traditional Sri Lankan fishing pole on Weligama Beach. Posted in Sport Links Travel Blog.